With this post I become a life-time member of The Craftsy Cheerleading Club. Quite likely the oldest member of the organization, but my enthusiasm matches that of a sophomore. This class in particular Pies and Tarts for Every Season, is taught by Gesine Bullock-Prado. I’m a bit distant from TV (except for binge watching stuff like Broadchurch, Outlander, Black Mirror) so I had no clue she is such a hot commodity in the media. Deservedly so. Teaching is a bit of a performing act. You need to capture the attention of your students and at the same time convey your message in a clear and efficient way. Lightening up a lecture using jokes and funny analogies is a nice way to make sure your audience stays with you. However, balance is everything. There is a delicate line to negotiate between lightness and solid info, and she really shines at it. I learned a lot about pie crusts, how to manipulate each kind, how to choose which crust to bake depending on the type of filling. All in a fun, relaxed way. I am always amazed at the quality of online classes offered by Craftsy, and the reviews by users are for the most part spot on. Before buying any class, you can browse through to see exactly what you’ll be getting, and the feedback from other users. A win-win situation. Now, for the bit of bad news. 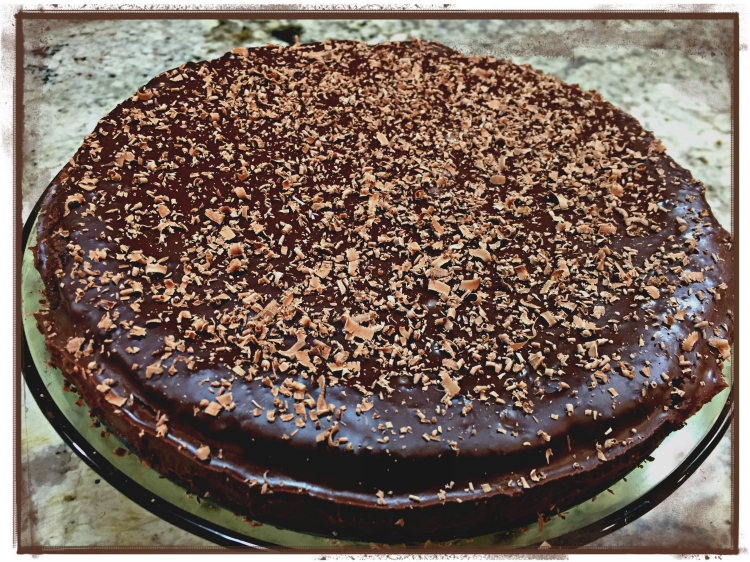 I could not get permission to publish the recipe, so if you are interested in the exact formula Gesine used for crust and filling, you’ll have to get it from the site. It all starts with the crust. You have several options. You can make a single larger tart, or shape about 50g of dough per tartlet, using muffin rings or a tartlet pan like I did. Compared to a muffin ring, my tarts were a tad bit bigger, so I used 60g of dough for each one. Her recipe has some cute twists, like using condensed milk in the dough. It gives not only a more intense sweetness, but it browns nicely in the oven. Following her detailed instructions, I was happy to get all tarts to bake evenly, no soggy bottoms (who wants to have that? not me! ), and basically zero shrinkage (scary thought). 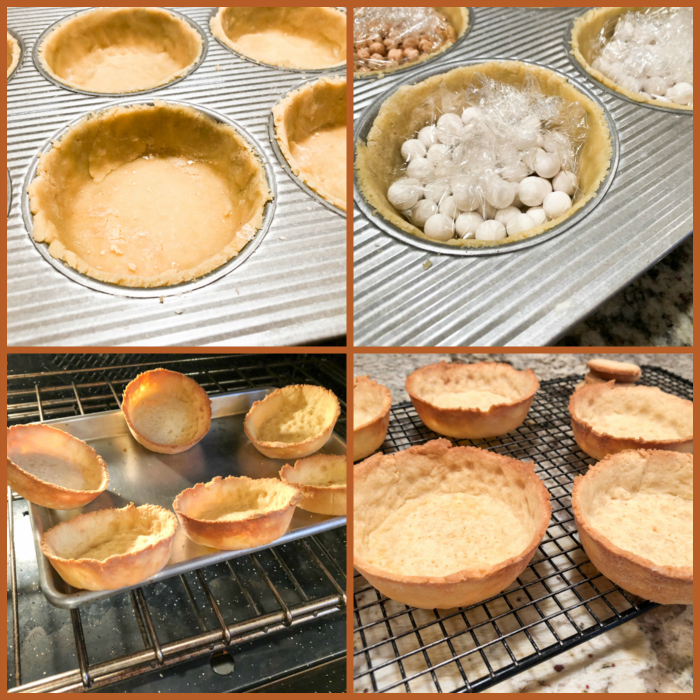 I added my own little twist to the preparation by placing the pie weights (and dried beans) into the shells using food grade plastic wrap instead of parchment paper. It does not melt in the oven, as long as you crumble it on top preventing it from touching the metal of the pan, you’ll be fine. I love the way it allows the beans and ceramic balls to reach the edge of the tart. As long as you don’t bake the shells in a higher than 400F oven, no problem. After the initial baking with weights, I removed them, got the shells back in a baking sheet and baked with the bottoms up in the air as shown in the photo. I just wanted to prevent any soggy bottom phenomenon (watching Great British Bake Off made me traumatized about those). For her caramel recipe, she uses a bit of maple syrup in addition to usual suspects. 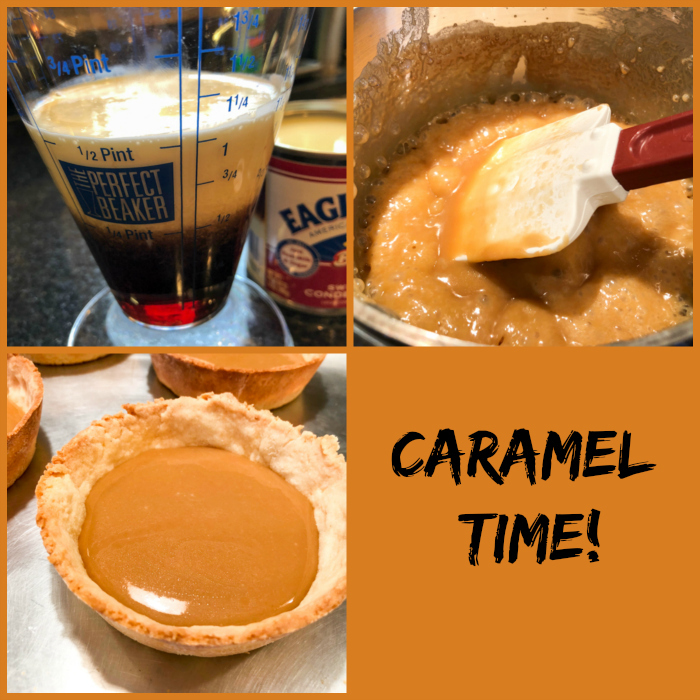 Any caramel recipe you enjoy will do, make sure to cook it to the correct temperature, 240 F, that will provide the perfect texture. No caramel running out when you slice the tartlet, no biting into a rock either. 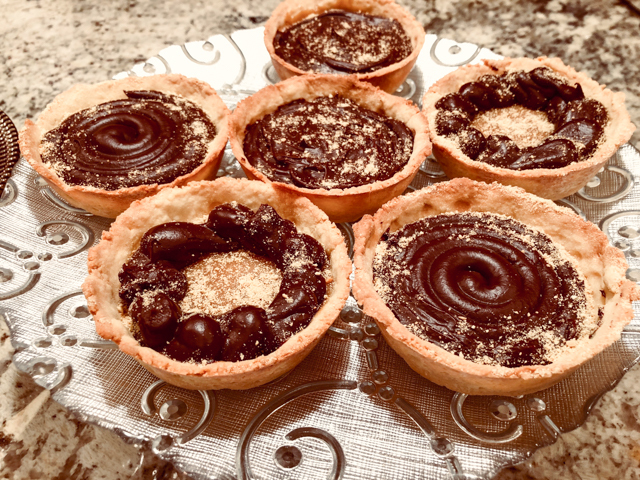 It hardens very quickly, but I still allowed the filled tartlets to rest at room temperature for a good 45 minutes before adding the chocolate ganache. Again, any recipe will do, but you need to have it almost cool to room temperature, so that it pipes nicely using a 1/4 inch piping tip. You can be creative, do swirls, waves, fill it solid and play with the surface using an off-set spatula. Once it’s set, sprinkle Graham cracker crumbs on top, or anything else you might like. A drizzle of white chocolate? Oreo crumbs? Gold leaf in pieces? Or as Gesine does in the video, top with toasted mini-marshmallows and call them Caramel Smore’s Tarts. Brilliant! You can probably see a picture on Craftsy. Adorable stuff. 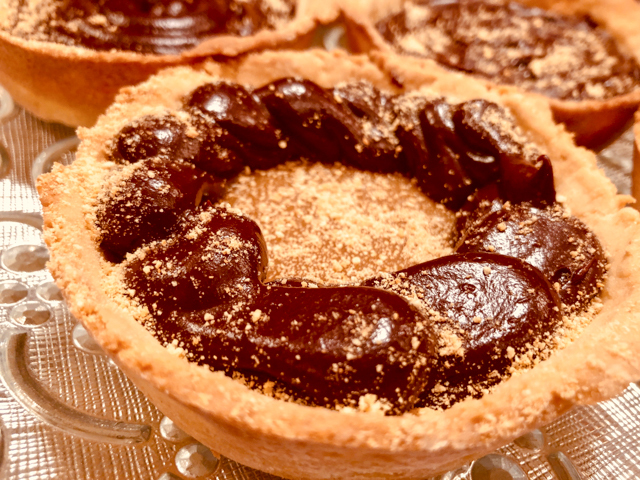 That’s what you want… A nice layer of caramel in between the crunchy crust and the luscious chocolate ganache. 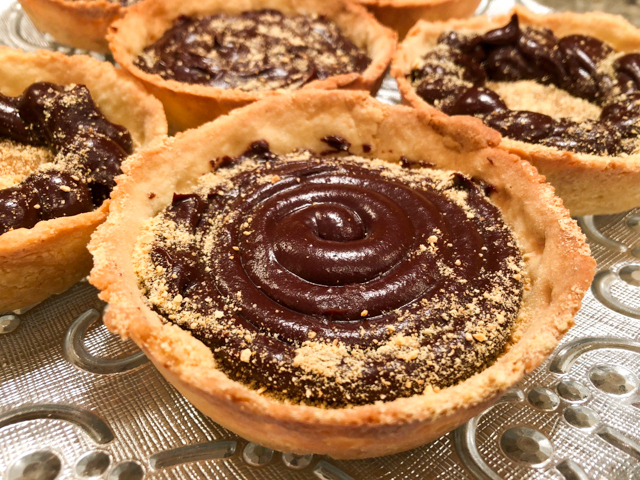 Next time I will use muffin rings, so that the top of the crust will be leveled with the chocolate. If you have muffin rings, give them a try as tartlet containers. Did I mention these would be amazing on Valentine’s Day? I have quite a few of your projects on my list of stuff to try soon…. Flourless Chocolate Cake is one of our favorite desserts. Creamy, chocolate-y, sweet, intense, decadent but not too much. Not until I took it to a new level, that is. First, I added orange zest to the batter. Not a lot, but enough to give the cake a brighter flavor. Chocolate and orange is another one of those culinary matches made in heaven, if you ask me. This cake proves it. But what really took care of decadence was adding a ganache on top, and then shaving Valrhona chocolate all over. OMG, this was stupendously good. In a small bowl, sift the sugar and combine it with the orange zest. Rub the zest with your fingers to release the oils into the sugar. Reserve. Combine the chocolate and butter in a double boiler over simmering water, heating until fully melted and smooth. Transfer to a bowl, let it cool slightly for a few minutes, and whisk in the egg yolks and vanilla. Add the sugar/orange mixture, salt, and cocoa powder, while constantly stirring. Whip the egg whites to soft peaks. Gently mix about one-third of them into the chocolate mixture, fold the remaining whites trying to deflate them as little as possible. Pour the mixture into the prepared springform pan. Place in the lower rack of the oven and bake for 25-28 minutes. Remove the cake to a rack and immediately loosen the sides of the pan. Allow the cake to cool before icing. If the cake is too uneven, shave the protruding parts with a serrated knife to even out the surface, but no need to make it perfectly flat. Usually the edges will be a bit too high, with a collapsed center. Make the ganache by heating the whipping cream in a small saucepan until bubbles appear along the sides. 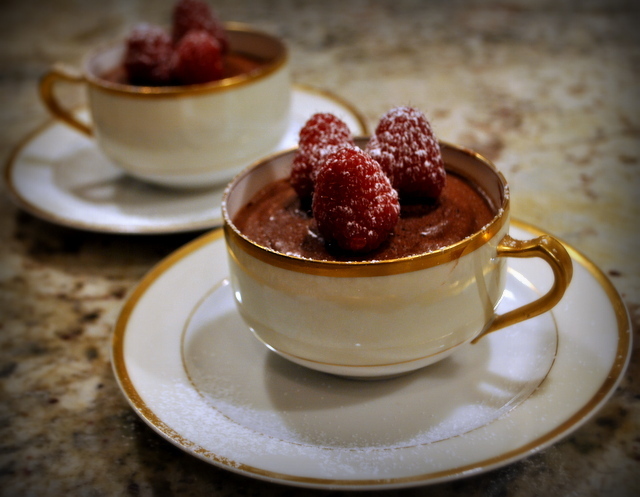 Place the chocolate in a small bowl, and add the hot whipping cream and the vanilla on top. Mix gently until the chocolate is fully incorporated, very smooth. Let it cool for 10 minutes, then pour over the cool cake. I like to do that by placing the cake back in the springform pan, so that the icing is contained. Refrigerate for a couple of hours. Open the pan and remove the iced cake to a serving platter, leaving it at room temperature for half an hour or so before slicing it (a wet knife is a must). I apologize for not sharing a picture of the sliced cake, but I do not like to take pictures when we are having a get-together. 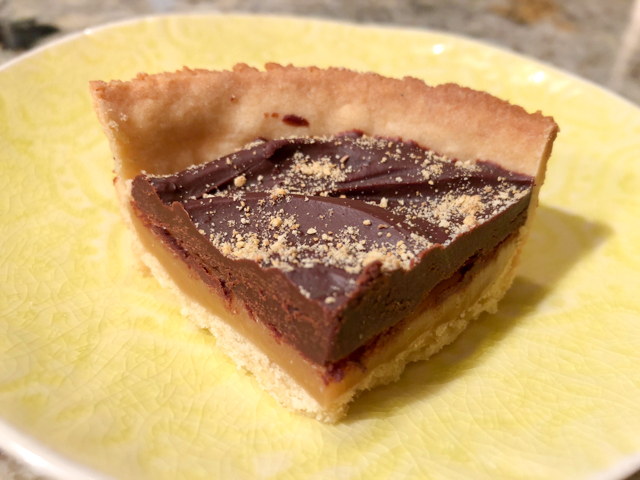 Just imagine a very dense, moist, perfect slice, that when you cut with your fork, will leave a nice coating of slightly melted chocolate on its tines. You then use your lips – with as much elegance as humanly possible – to clean the fork, and repeat the process. Ad libitum. Have I mentioned that Valentine’s Day is coming up? THREE YEARS AGO: Sweet Fifteen! I feel the need to redeem myself after sharing a recipe that reduced my life expectancy a little, and added considerable more gray hair around my face. Maybe you are like us and prefer to stay home in Valentine’s Day? After all, it’s hard to beat a home-cooked dinner with the fireplace going and a nice glass of wine… Maybe you are planning on a store-bought dessert to make your life easier? Well, I am here to change your mind. 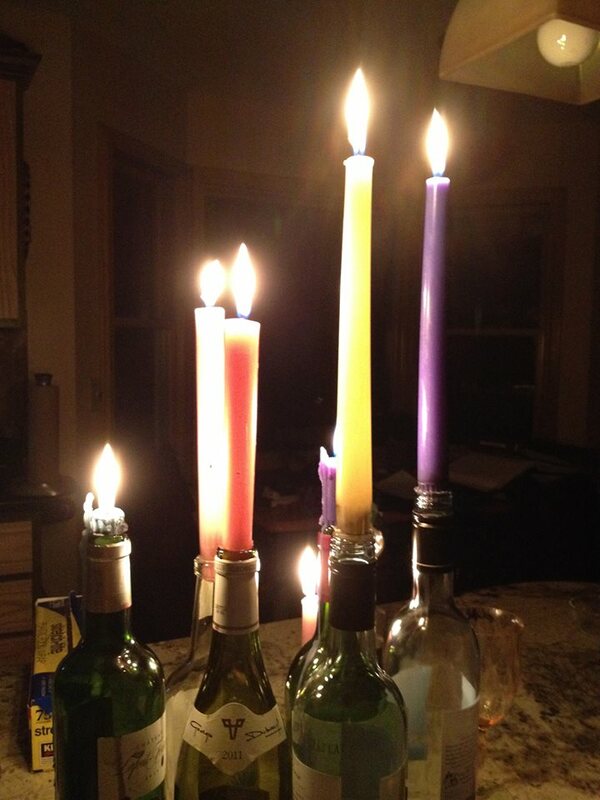 This is one of the simplest ways to end a romantic meal, and so easy to put together it is almost a non-recipe. You can make it the day before, you can make it in the morning, you can make it just a couple of hours before showtime, whatever suits your schedule. Come to think of it, it is the antithesis of a sugar cookie with royal icing. And, let’s face it, a truffle is a lot more elegant and grown up. Plus no need to spend 1 hour and 49 minutes cleaning up the kitchen when you’re done. The recipe comes from the new FoodTV show Giada Entertains, which truth be told puts me in a compulsive eye-roll mode. Still, some recipes seem like winners, and this is definitely one. She called them poppers, I am calling them truffles, and you’ll soon understand why. 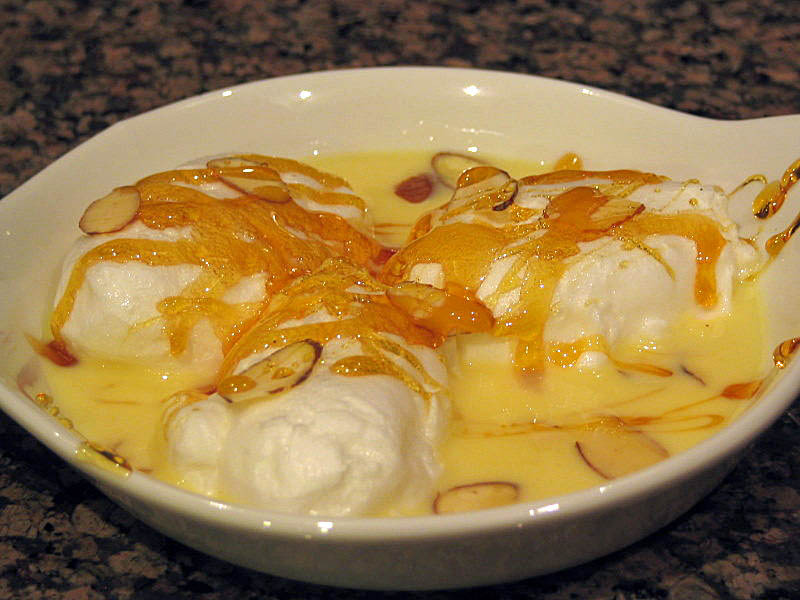 Add the heavy cream to a small saucepan and warm it gently over medium heat until small bubbles form around the edges. Place the chopped chocolate in a medium bowl and pour the hot cream over the chocolate. Let sit for about 2 minutes, then stir with a whisk, working from the center of the bowl outwards, until the ganache mixture is smooth and well incorporated. 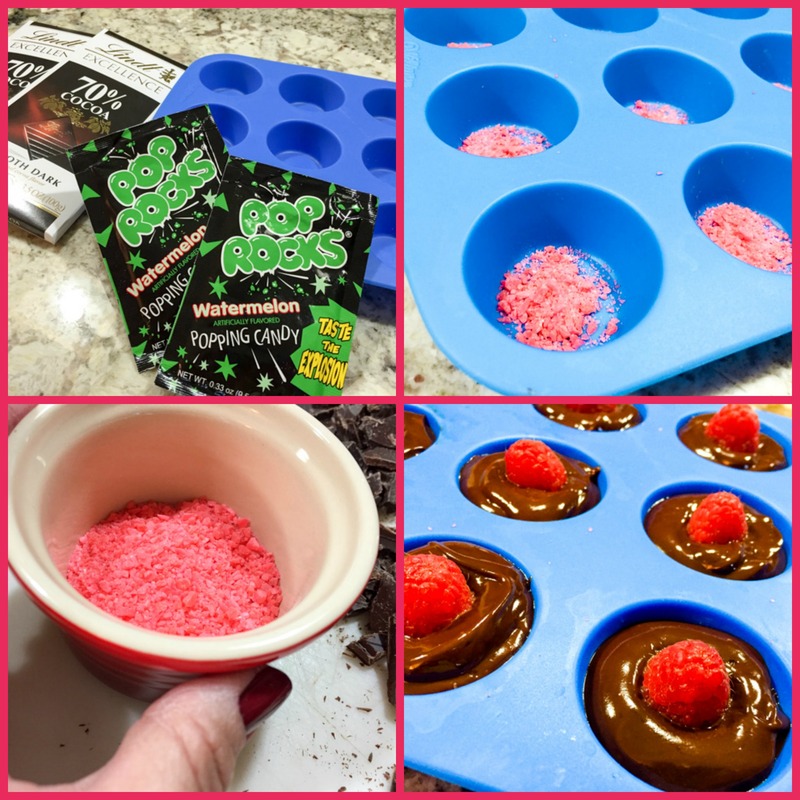 To a 12-cup silicone mini muffin pan, sprinkle 1/2 teaspoon Pop Rocks in each cup. 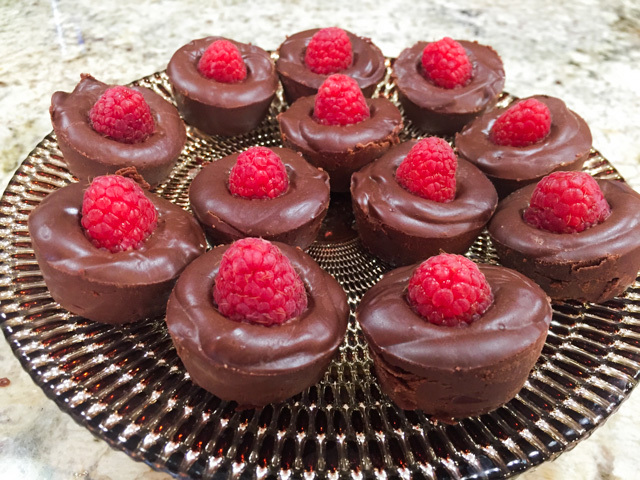 Divide the ganache evenly among the cups and press the raspberries on top. Refrigerate until set, at least 2 hours. I refrigerated them overnight. Just before serving, unmold the tarts. Comments: As you know, I did not grow up in the US, so most kid-friendly candies are unknown to me. For instance, popping candy, or pop rocks. I was clueless about them, but when I saw Giada’s face as she poured some in her mouth, I could not wait to try some myself. Problem is, they were nowhere to be found. I searched all grocery stores, even tried Walgreens, but no luck. So I did what any sensible human being does, took a virtual stride to amazon.com and placed an order. I specified the flavor used in the show, Original Cherry. The package took forever to arrive, but when it did, watermelon pop was inside. Oh, well, it’s also pink, and it pops. I decided to go with it. TWO YEARS AGO: Happy Valentine’s Day!